In early 2013, I had sought refuge in Alpha’s home, and while I was there I tried to find a way to better manage one effect of my depression, which was memory loss. I’d recovered enough that the far more insidious “thought process loss” effect of depression had become manageable, so I directed it to supplementing my memory through the method of loci. The method of loci as a memory tool that attaches a notion to an imagined location. This makes a notion much easier to access than if that notion were just of the mind like an ordinary thought. The proper use of this method is more complicated than imagining a happy place, though, and… I’m not. 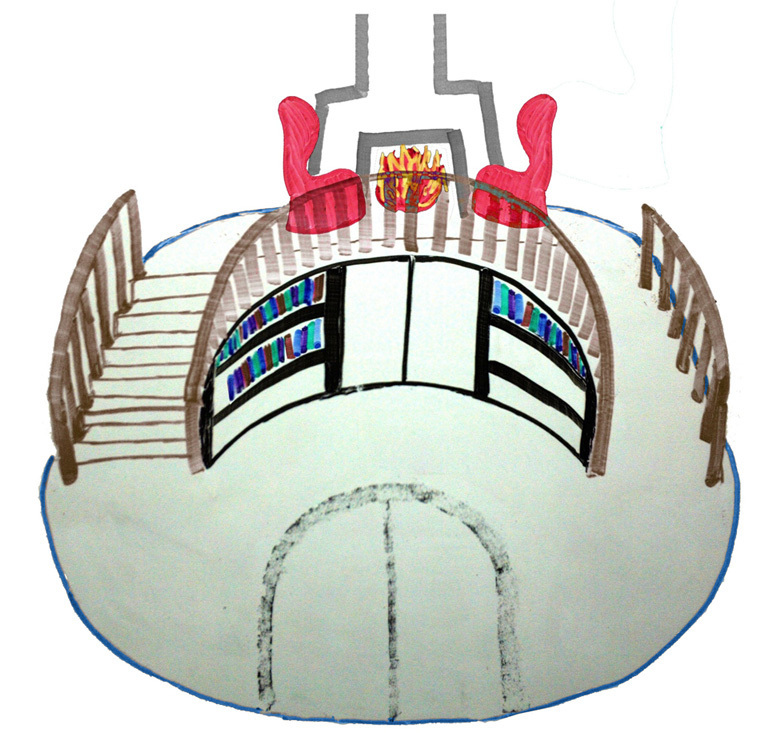 So, I could think up of a round-walled library with a glass dome of a ceiling to let the natural light in, with stairs and wheelchair access to a fireplace area that had cushioned armchairs, and a hidden passageway in the central bookshelf. I imagined this enough that I eventually didn’t need to try so hard: my library would always be ready for me to go into in my mind. Attaching a grocery list to the banister, however, was more psychologically acrobatic than I could manage. Granny Weatherwax had never heard of psychiatry and would have had no truck with it even if she had. There are some arts too black even for a witch. She practiced headology—practiced, in fact, until she was very good at it. And though there may be some superficial similarities between a psychiatrist and a headologist, there is a huge practical difference. A psychiatrist, dealing with a man who fears he is being followed by a large and terrible monster, will endeavor to convince him that monsters don’t exist. Granny Weatherwax would simply give him a chair to stand on and a very heavy stick. For as long as I can remember, I have dreaded and feared this invisible shadow, this inaudible chord, these intangible bonds. Perhaps these were all just in my imagination, but this consideration did nothing to assuage the fear. When my imagination gave these form, however, then they felt like something that I could fend off with that same. Sometimes. For one example, the dread of walking a hall at home after lights-out took on a more specific location, and the form of a hooded figure with a gaunt face. I could imagine a wall of electricity between this figure and myself, and this accompanied with the conviction that going near me was against some sort of playground rule. Whether that conviction created the wall, or the wall supported that conviction I don’t remember. Sometimes the figure would be caught in the electric net, and this would give me some time to run past it until it lost me. Other times, it would float right through or appear within the bounds, laughing, and I wouldn’t know why the wall wasn’t working this time. I certainly didn’t want anxiety, conflict, or even adventure. I tried to imagine it all away, but whatever logic, courage, or dismissive attitude I could muster would crumble into gut-wrenching horror. I didn’t want this, but I didn’t know how to exorcise it. I grew out of it, but maybe it did have something to do with the depression I fell into much later. I worked on recovering many aspects that most people have naturally, and just didn’t have what I needed to grow into self-sufficiency. My only parent died. My only sibling continued the pattern, adding substance abuse to the mix, and systematically tripped me every step forward that I could take. 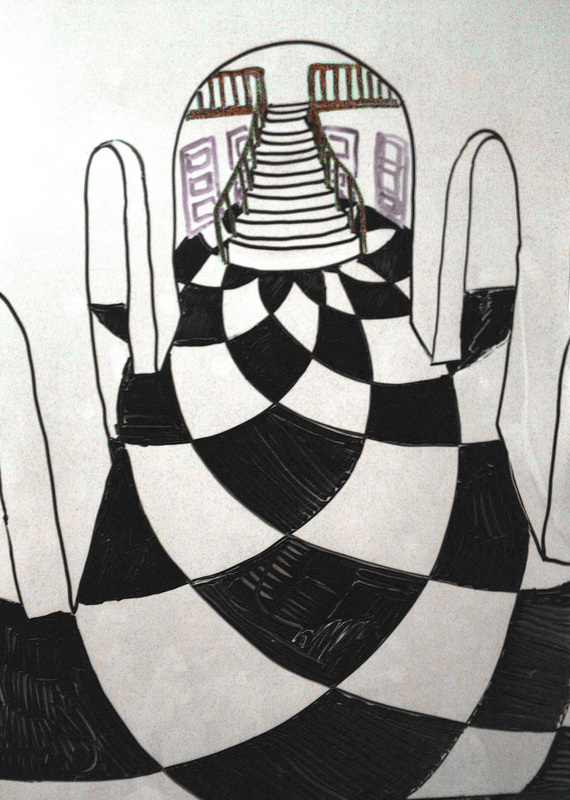 I wrenched myself out of there, no plan, no skills, no real connections—to the house of a friend of the family’s. In this strange place, I had two spontaneous episodes of far-fetching. The corresponding overlay would be remarkably peaceful, even stagnant. Strange, then, that I would return to the Mainland and sense sharp threats growing towards me from the corners and edges of the room they lent. Maybe it was me. This is the only relevance to the story: While I lay waiting for sleep, I would imagine standing ready with a sword. I’d leap up, land, slash across—and whatever I was fighting, it or they would shrink back. I made a story, just for myself, about what I imagined, and by that I don’t mean that I wrote a story (except for this text, which is actually telling this story) but that I conceptualized a story that I would live. It was about the name of the swords: the katana, Mercy; and the wakizashi, Justice. My sense of these respective names, I decided, were what had given these weapons form. I had defined the concept, lower-case, justice and mercy, in a way I hadn’t been able to before. I dreamed that a man made out of water, that I’d met before, also in a dream, and named Eddy– he laid four swords before me. I certainly recognized the swords. Eddy asked me if I could tell the difference between the two black-handled wakizashi, Justice and Spite. It was like the ritual for locating the Dalai Lama, where a bunch of toys and other items would be laid before an infant, and if he selected the items that used to belong to the previous Dalai Lama, then he must be a reincarnation because he was drawn to what was familiar. I couldn’t do it with my own weapons, in this life. It might have ended there, with me just having to admit that I simply do not know something as basic as Right from Wrong, but when I felt the compulsion to tidy up, I picked up Justice and Spite and held them together. They melded into a single weapon, which gave me an epiphany. “I forged these as part of a psychic sort of symbolic fighting style that I envisioned,” I explained to Eddy. “It came from the conviction that mercy and justice are one and the same thing, if given that the entire conflict is fully understood. Mercy without justice is not true mercy, because coddling will enfeeble the receiver of such a virtue when real virtue will not do such harm; likewise, merciless justice is unjust because it only perpetuates violence and corruption of power. A full, true kind of Understanding shows a middle way, a course of action that incorporates both, so that both can truly be their respective virtues. I thought that they lacked one another, and that separation and subtraction was the illusion. “I thought that I could keep them as separate parts, than when brought together dispel illusion and create a whole. Some illusions are necessary, if a subject’s capacity to understand is rudimentary–” I went ahem and pointed at myself, “– so there were times to implement Mercy alone, or Justice alone, for a needed and/or satisfactory outcome. Now I see that, that these virtues are not merely incomplete when they are separated– they are infected. Eddy nodded, unimpressed, and I sensed that whatever test or trial that I’d been dropped into unprepared– was over, for now. I also got the impression that there is no right or wrong answer in something like this, but there was just my answer. Still, I couldn’t help feeling disappointed, as if there should have been some great double gates that opened up somewhere to symbolize my graduating to a higher spiritual level. Well, I did keep the swords, because samurai swords are just wicked cool. Perhaps there would have been pomp and circumstance if I’d given them up for a slingshot named Insight, or a rocket launcher named Awesome or something.